The good news of the above phrase is that the nights grow longer. The summer Milky Way is still accessible, thought we will soon lose the south end of the Milky Way at Sagittarius and below. September skies give us the best of both the Milky Way, our galaxy, and of other galaxies, notably the Great Andromeda Galaxy. Lets look at some of the wonders of September skies. Overhead is the constellation of Cygnus the swan that lies in the direction the solar system is moving at 300 kilometers per second as we orbit the center of the Milky Way. Cygnus is also known as the Northern Cross, an informal constellation or asterism. East of Cygnus' brightest star, Deneb is a hazy glow that can be seen with the unaided eye on a dark night. It can also be seen in binoculars, but is too big and diffuse for the telescope. 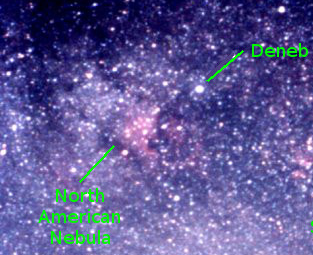 It is the North American Nebula. Starting to come into view is the Great Andromeda Galaxy. It was recorded by French comet hunter Charles Messier as number 31 on his list of fuzzy objects in the sky that weren't comets. So we know it as M31. See the finder chart on the below. 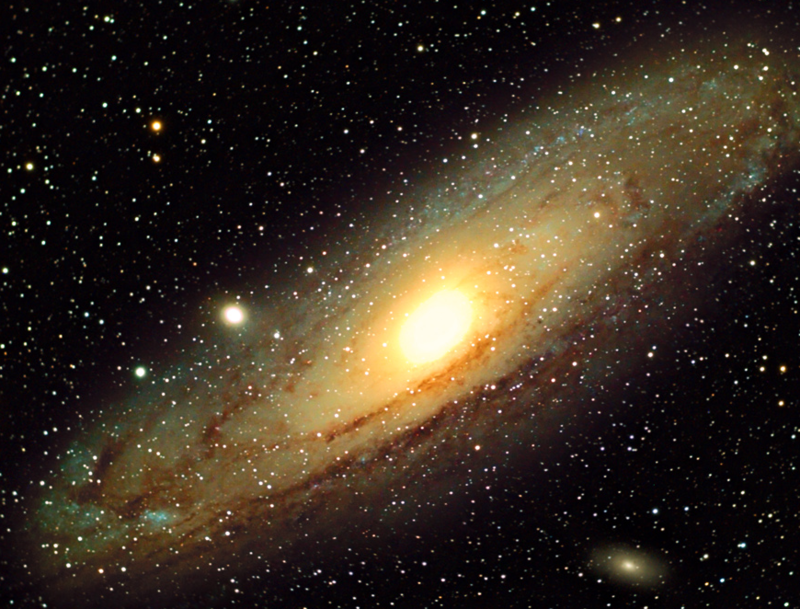 M31 is climbing up in the northeastern sky. It is barely visible to the unaided eye as a fuzzy spot among the stars of Andromeda just to the left of the Great Square of Pegasus. Binoculars give a better view, the dim glow becomes spindle shaped. In a telescope using the lowest power available, more of the galaxy can be seen along with the satellite galaxy M32, a nearly circular elliptical galaxy. Another, fainter and more elliptical galaxy is seen farther on the other side of M31, It is M110. Photographs of M31 show the satellite galaxies a lot closer to the main galaxy then visually at the telescope. That's because visually we can only see the bright central bulge of the Great Andromeda Galaxy. The spiral arms are too faint to see. If we could see those arms, M31 would appear as large as 6 full moons side by side. However there is a hint that the elliptical glow of M31 isn't that of an elliptical galaxy to the eye. The north edge of the central glow ends abruptly, at least more abruptly than the on the other side. That is caused by the dark lane between it and a spiral arm. Another treat is the Double Cluster, seen in binoculars or a small telescope. Not shown on the chart above, it can be found half way between Perseus and Cassiopeia. The double cluster inexplicably didn't appear in Messier's list. 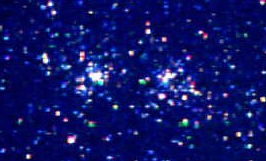 However each cluster has star designations: h and c.
It is a wonderful sight in telescope at it's lowest power. Even a laege telescope can squeeze most of the stars of both clusters with a very low power, wide-field eyepiece. The double cluster can be seen with the unaided eye. Indeed it was recorded by the Greeks in 150 BC. The Double Cluster lies at a distance of about 7,650 light years and its stars are dimmed by 1.8 magnitude by the dust and gas in the plane of the Milky Way. Being two magnitudes brighter they would be a spectacular sight without a telescope. The telescope overcomes the dimming to produce a spectacular sight. The photo below gives just a hint of the spectacular view. Stay up late enough in September and the Pleiades will rise, and even Orion before dawn. Just think: The Great Orion Nebula without the frostbite. Due to the solar eclipse occurring during the period that this newsletter (August 21, 2017) is normally put together. And the author’s own pinch of pre-recording radio programs and preparing for the solar eclipse we’ll post an oldie but goody. This is a reprise of a 2005 article with some changes on the skies of September. Uncredited photos are the authors.